Gordon (left) teaches Telly how to control his jealousy with breathing exercises. But first, Sesame Workshop is doing its homework. In partnership with the International Rescue Committee, Sesame producers and early-childhood experts are soliciting guidance and feedback from relief organizations, trauma experts, academics and others who have worked with refugees. They'll also be making research visits to refugee camps in Jordan. "And certainly I think it's fair to say there are no more vulnerable people in the world than these refugee families and kids," Jeff Dunn, the CEO of Sesame Workshop, told a small crowd at the nonprofit company's New York headquarters recently. Sesame's goal is to develop new content — adapted for a variety of platforms — that will "bolster children's resiliency" as well as improve their language, math and early reading skills. The target age group is children ages 3 to 6 and their caregivers. You can already see Sesame Street in more than 150 countries. Locally adapted versions are broadcast around the world, including in the Middle East. Sesame Workshop plans to draw on its foreign production partners for support in developing content for refugees. And so to inform that content, Sesame gathered representatives from a range of organizations including UNICEF, Lebanon's Ministry of Health, the Arab Network for Early Childhood Development, World Vision, the World Bank, Harvard University and Columbia University. It was a day of sharing knowledge, raising questions and, of course, watching Sesame Street videos. Abby Bucuvalas, Sesame's director of international education, showed video clips from existing content that addressed different social and emotional themes. In a video about coping, for example, the adult human Gordon shows the Muppet Telly how to take deep breaths to help him calm down when he's feeling angry. "Some of the things that we're really trying to influence are children understanding that they have big feelings and that there are things they can do to manage those feelings or emotions," Bucuvalas explained. Another clip — about inclusivity — came from Sesame Street in Brazil. In it, Big Bird feels left out because he's too tall to play limbo with the other Muppets. So his friends adapt the game so that he can play, too. This video raised a red flag for some of those who work in the Middle East. Cairo Arafat, who oversees production of the Arabic language Sesame Street from Abu Dhabi, urged her colleagues not to make assumptions that refugees will share their values such as inclusivity. "In many of these populations," she said, "children are still taught, 'No. Be wary of the people who don't talk like you, don't look like you or come from a different sect.' " With the special conditions facing refugees — including security issues — Arafat advised careful thinking about what they would like to teach. For Sesame Workshop, it was a full day of lessons like this. Another topic of discussion was how to help children understand the stress their caregivers are under. "It's very important to explain to children how parents feel about displacement, about losing their homes, about moving to a new country," said Rabih El Chammay, a psychiatrist and head of the National Mental Health Program of Lebanon (where there are more than 1 million Syrian refugees). "Children notice what their parents go through but they don't understand it. They get puzzled: 'Why is Daddy shouting at me now? I didn't do anything wrong.' "
Absorbing different perspectives will only make whatever content they decide to create stronger, says Sherrie Westin, Sesame Workshop's executive vice president for global impact and philanthropy. She notes that this is how Sesame Workshop approaches any new project. "Before we really can begin anything in earnest, we bring together advisers from the outside and we try to learn as much as we can," she says. Shari Rosenfeld, Sesame's senior vice president for social impact, adds that the New York gathering was important, but "insufficient, until we go back to the region, back to Jordan, back to Lebanon, back to Iraq and bring some of the working hypotheses to say, 'OK, we're going to test these with you. What makes sense? Help us figure out where to focus.' "
Sesame's pilot refugee project is being funded with support from the Bernard Van Leer and Open Society foundations (Open Society also provides support for NPR). A team from Sesame Workshop is traveling to Amman, Jordan, next week. It has organized a kind of focus group for Syrian refugees. Children and families will view existing Sesame content and give feedback. The Arabic version of Grover, named Gargur, will be there, too. Elmo and Big Bird have lots of experience educating children about all kinds of things from the alphabet to autism. Well, now, Sesame Workshop wants to help millions of refugee children from Syria, Iraq and other war-torn countries. But first, they're doing their homework. NPR's Elizabeth Blair has our story. ELIZABETH BLAIR, BYLINE: At Sesame Workshop's headquarters in New York recently, CEO Jeff Dunn told a small crowd the company has a responsibility to help the most vulnerable among us. JEFF DUNN: There are no more vulnerable, you know, people in the world than these refugee families and kids. BLAIR: So Sesame Workshop is working with the IRC, the International Rescue Committee. The two organizations invited relief workers and public health experts from around the world to come together to share their knowledge, answer questions and watch some "Sesame Street." BLAIR: Sesame Workshop's director of international education, Abby Bucuvalas, showed the group existing content with different themes like coping. ABBY BUCUVALAS: Some of the things that we're really trying to influence are children understanding that they have big feelings, and there are things that they can do to manage those feelings or those emotions. BLAIR: Like taking deep breaths, as the adult human Gordon shows the Muppet Telly when he's really angry. ROSCOE ORMAN: (As Gordon) OK. Try it. In. UNIDENTIFIED ACTOR #2: (As Telly) In through my nose and out through my mouth. ORMAN: (As Gordon) Good. Now, talk to yourself and say calm down - like that. UNIDENTIFIED ACTOR #2: (As Telly) Calm down, Telly. BLAIR: Another big theme that came up was inclusivity. In a clip from "Sesame Street" in Brazil, Big Bird feels left out because he's too tall to play limbo with the other Muppets, so his friends adapt the game so that he can play, too. UNIDENTIFIED ACTRESS: (As character, foreign language spoken). UNIDENTIFIED ACTOR #3: (As Big Bird, foreign language spoken). BLAIR: But this video clip raised a red flag for some who work in the Middle East. 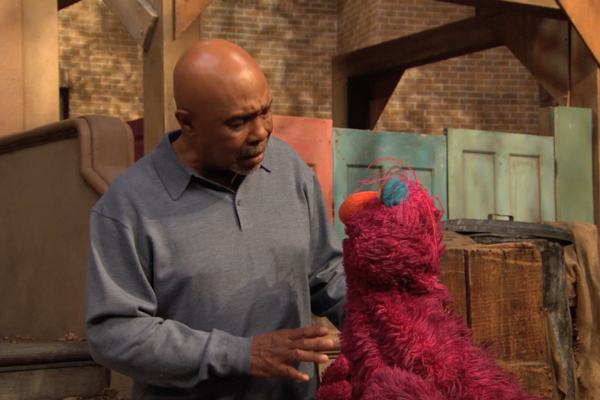 Cairo Arafat oversees the production of the Arabic-language "Sesame Street" from Abu Dhabi. She urged her colleagues not to make assumptions that refugees will share their values like inclusivity. CAIRO ARAFAT: Many of these populations, children are still taught no, be wary of the people who don't talk like you, don't look like you, don't, you know, or come from a different sect. BLAIR: With the special conditions in refugee camps, Arafat said think carefully about what you're trying to teach. For Sesame Workshop, it was a full day of lessons like this. Another big one - teach refugee children what their caregivers are going through. RABIH EL CHAMMAY: Children notice what their parent goes through, but they don't understand it. BLAIR: Dr. Rabih El Chammay is a psychiatrist and head of the National Mental Health Program of Lebanon, where there are more than a million Syrian refugees. EL CHAMMAY: They get puzzled - why is daddy shouting at me now? I mean, I didn't do anything wrong. And it's very important to explain to children how parents feel about displacement, about losing their homes, about coming to another country. BLAIR: Shari Rosenfeld, Sesame's senior vice president for social impact, says while the seminar in New York was important, it's just the beginning of their process. SHARI ROSENFELD: It's insufficient until we go back to the region, go back to Jordan, back to Lebanon, back to Iraq and bring some of the working hypotheses to say, you know, OK, we're going to test these with you. What makes sense? Help us figure out where to focus. BLAIR: A team from Sesame Workshop is traveling to Amman next week. They've organized a kind of focus group for Syrian refugees. Children and families will view existing "Sesame" content and give feedback. Grover will be there, too. Elizabeth Blair, NPR News. ERIC JACOBSON: (As Grover, singing) I am blue. Transcript provided by NPR, Copyright NPR.